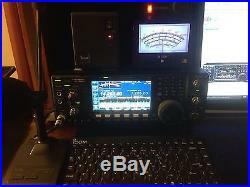 Up for sale is a like new Icom, IC-7600, HF/50MHz All mode transceiver with accessories. This is a NICE radio and well cared for, NO issues at all. Complete with built in High speed tuner, LDG M-7600 external multifunction meter, New unused OEM Mic. Nice SM-20 desk Mic. 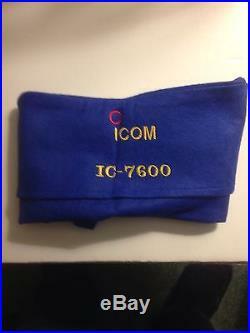 Matching ICOM USB Keyboard, Custom IC-7600 Dust Cover, and Nifty Mini- Manual. Also complete with PS-126 4-pin cable-type power supply unit (Output: 13.8V DC, 25A max) original factory box, all paper work, and operating manual. 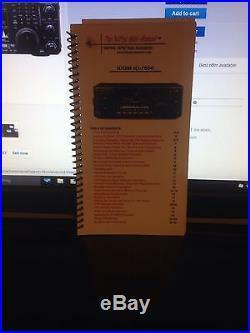 ICOM SM-20 Desk Mic. IC-7600 HF/50MHz All mode transceiver. Get the performance advantage based on the latest DSP technologies developed for the IC-7800. Separate DSP units for the transmitter/receiver and spectrum scope. Improved inband IMD using double conversion superheterondyne system. Three built-in 1st IF (roofing) filters: 3, 6, 15kHz. 5.8-inch ultra-wide TFT display with LED backlighting. High-resolution real-time spectrum scope. Easy connections for flash memory drives and PCs. Built-in PSK and RTTY operation with a USB keyboard PC not required. Simultaneously receive two signals in the same band with Dualwatch. Digital voice memory records incoming signal and will immediately replay audio. Built-in high-speed automatic antenna tuner. Two Tx/Rx antenna connectors with automatic antenna selector. The item “IC-7600 HF/50MHz All mode transceiver with accesories, NICE” is in sale since Saturday, May 21, 2016. This item is in the category “Consumer Electronics\Radio Communication\Ham, Amateur Radio\Ham Radio Transceivers”. The seller is “farfell2222″ and is located in Toms River, New Jersey. This item can be shipped to United States.